I just got my latest copy of The Cedar Sweeper magazine in the mail which includes my latest article. I'm so pleased to have my work featured in a magazine dedicated to Michigan fly fishing. I believe this is the fourth article of mine to be published in TCS and I can't thank publisher Chuck Sam's enough for including my work. I really think this may be my best piece yet, an ode to summer titled "Summer, the Once and Future Dream." I'll publish it here once the current TCS issue has run its course. 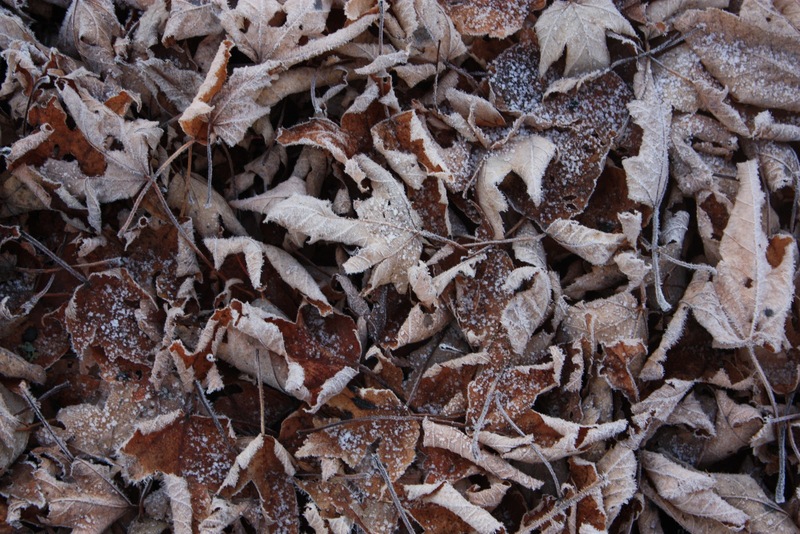 I just posted "The Big Chill" a week ago which was in the fall issue. If you are a Michigan angler, or interested in the fishing here, you should seriously consider subscribing. 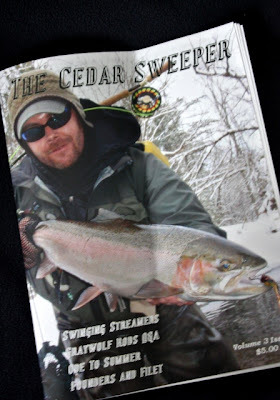 This issues includes an interview of Shane Gray of Graywolf Rods (frequently featured on The Fiberglass Manifesto including today), an excellent piece on swinging streamers for Michigan steelhead, and coverage of local culture featuring Founder's Brewery. Okay. I've had it. This post may seem reactionary, what with the latest firestorm kicked of by Lefty Kreh with his comments about tenkara, but I've been planning this post since I started this blog. Personally, I am sick of all the sanctimony and acrimony in the outdoor world. I had to hear about the latest public fly fishing spat via Troutrageous. As always, Mike Agneta was the hilariously intelligent voice of reason. So I am going to go waaaaaaaaay out on a limb here. NO MATTER HOW WE CHOOSE TO FISH, WITHIN THE BOUNDARIES OF THE LAW, WE ARE ALL JUST BOTHERING FISH. There, that wasn't so hard. I know. I just don't get it. I don't "get" tenkara, or bamboo, or glass, or swinging to steelhead, or the dry-flies-only aesthetic. I fly fish by choice. I started out like 100% of you- with a worm on a hook. Whatever minor percentage of you never did that, I feel sorry for you. It is a fisherman's right of passage, like starting off as an apprentice in the union shop, or whatever your path to stardom was. If you were born with a silver spoon in your mouth and started off fly fishing, you have my pity. Making the full progression from bait fishing to fishing spinners and hardware to fly fishing has made me who I am. I've sold all of my conventional gear, and except for a couple of spinning rods for perch fishing, I only have fly gear. This is my choice. I spent years here spinner fishing. I caught thousands of fish. I averaged 20-50+ fish per outing. I regret this to some degree now, as I feel that spinners are particularly damaging to fish. But it was fun, exciting, and I learned everything I know of stream-craft from doing it. It is only because of my years spent spinner fishing that I am comfortable fly fishing at night alone- I learned how the sand and gravel flow in a river bottom and always know where I can safely wade just by reading the surface currents and the bend and flow of the river. I transitioned into fly fishing full time over the last five years, but I have fly fished since I was 14, and it has always had a special place in my heart, it has always been the goal. I've reached that goal now, and I'm happy with it. I'm still striving. I have further goals. But many times I am just happy that I fly fish. I want to better my tying. I want to improve my cast. I someday wish to buy a spey rig and learn spey casting. It has such gorgeous rhythm and flow. I even have half an interest in tenkara and glass. Honestly, I love it all- fly fishing is this endlessly fascinating spiral of techniques, gear, species, flies and waters, and I'm circling the bowl. Fly fishing is my aesthetic, it is what I love. I've recognized that I'm still just bothering fish, but in the style that I love. I recognize that bait fishermen and hardware casters and fly anglers have equal rights to their pursuits- we are all just bothering fish, in the way that appeals to us. What damages the outdoors and angling is the entry of sanctimony- the idea that some form of bothering fish is superior, pure, sacrosanct. Tenkara is an easy target, as some have actively promoted it as a "pure" form of bothering fish, so let me address another angle- last year I listened to a podcast of April Vokey in which she referred to egg flies as "bait". To paraphrase, she suggested that if you want to use egg patterns you may just as well use bait. Really? Now, I love April (yes, she is aware of that) but I find this viewpoint a little difficult. Having made my progression from bait to hardware to flies, I understand the aesthetics. Swinging flies to steelhead on a big western river via spey gear is on my life list, but aren't all flies doing the same basic thing- either eliciting a feeding response or reaction/aggression strike? Some of the eggs I tie and fish don't even remotely match a natural. How exactly do we attach a value to one over the other? Difficulty is always a measure of skill and value, but should we develop a method so esoteric that we never catch fish? After all, at some point, regardless of what we say, catching fish is the point. If you want to spend a day with nothing to show for your efforts, take up golf. What I'm trying to encourage my fellow anglers to do is embrace each other. That includes bait fishermen. Welcome and embrace anyone with a rod and licence legally and ethically engaged in enjoying the outdoors. I don't like running into a bait fisherman while I'm on the river, but now that I think about it, I don't really like running into anyone while I'm fishing. I'm just that way. If you run into someone who is obviously breaking the law or behaving unethically, say something or report them to the proper authorities. But don't discriminate because you enjoy a different style, or you release all your fish (eating fish is still an appropriate activity), or you feel that bamboo is the bomb. Pursue your own aesthetic, truly be yourself- and don't begrudge that right of others. Recognize that all the money spent for all the gear, bait, licences etc. all contributes to outdoor conservation and restoration via the Pittman-Robertson act. I don't care to ever handle worms again, but I bet the money from their purchase has done more to conserve and preserve rivers and fish than all the dollars spent on fly fishing ever. You've got to respect that. But I'll take this to a deeper level. The bait angler who fishes to feed his family has a nobler claim than you to his fishing. He's feeding his family, you are bothering fish. His angling feeds his kids; your angling entertains you, and worse, kills fish that you never intended to keep. Trust me, I know the counter arguments, so spare me. If you really love fish, then don't go fishing. Be strong enough to admit that you love fishing more than the fish; if you loved the fish for their own sake you wouldn't fish. We all like holding fish, we love their beauty, but if it was the fish that we loved, we would take up river snorkeling. ("I love cats, which is why I love kitten snaring.") And I don't care how gorgeous, intricate or traditional your flies are, I don't care how old or expensive your bamboo rod is, I don't give a crap how long the Japanese have been cane-pole fishing with flies, I don't care how cool glass is, I don't care how beautiful spey casting is- I don't care how you personally choose to bother fish. I only care that you get out there and enjoy it. Now go, bother some fish. The wind is crazy. It’s all I can do to paddle into it. I’m pushing as hard as I can, aiming for the next flat. Because this area is currently in the lee of this peninsula, I’m pushing onward. Shift that wind just slightly to the south and I would be facing six foot seas. As I paddle my kayak back into shallower water, large dark forms take shape. Schools of them. Dozens of them. I’m looking at over 200 fish in two feet of water or less. All of them are carp, the water is crystal clear, and there are no other anglers in sight. I’m a mile from the launch, and I feel as isolated as it is possible to be in the Tip of the Mitt area of northern Michigan. This wind is impossible, the water an impossible blue. The fish are impossible. When my fly hits the water, they run, when my line crosses them, they bolt. The smallest fish is 5 pounds, the largest are 30 pounds or more. Repeatedly, the wind whips my line sideways, away from my targets. Repeatedly my casts end in failure. Be sure and read the rest at the Backcountry Journal. I wrote this piece for the September/October issue of The Cedar Sweeper magazine, a local print mag. It's winter yet, and thus still relevant. 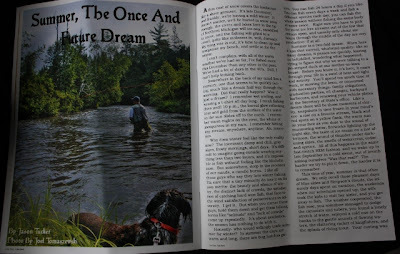 The Cedar Sweeper is a growing magazine about Michigan fly fishing. My thanks to publisher Chuck Sams for including me. If you're a Michigan fly angler or interested in Michigan fishing, consider subscribing. It's a great local magazine. I’m standing in the river up to my knees, just downstream from a bridge. I wouldn’t normally fish within sight of a bridge, but at this time of year it doesn’t matter, no one has fished here in weeks. It’s early December, and a foot of snow lines the banks. I’m the only person here, and I’ve rolled or caught a dozen small rainbows and one steelhead. Right when I’m starting to get bored, my line goes tight, and a two foot long brown rolls to the surface. I get a couple of head shakes out of him before he comes unpinned. What was a giant brown doing in that little spot, far from cover? No doubt he’s a lake-run fish. I know what all these fish are doing here- bright ovals in the gravel, and red-flanked weary shadows, coho salmon on beds, are drawing all these fish in to feed on eggs. I hook up on and lose four more chrome steelhead that day. I’ll have to work on that. Despite the chill, I’m warm in my wool and fleece. Only my fingertips and nose know the temperature of the air and water. As I write this, it’s early October. Another trout season has come and gone in Northern Michigan, and gone with it are the hordes of fisherman who filled every parking lot and access, seemingly every bend and pool. I enjoyed your company, enjoyed talking flies and lies, techniques, gear, hotspots, trips and all the typical bull that gets discussed by fisherman. I love the almost carnival joy of the convergence of people to a river. The summer trout season becomes one big long celebration, an exuberant expression of love for the gentle season, clean water, and wild trout. When the gadding was done, I gave you wide berth, went further in to find some solitude, or fished at night. For me, in the end, it’s about the fish and fishing, not other fishermen. It’s over now, and almost everyone has gone home. Once crowded lots are now empty, and it’s possible to find fish in lies they wouldn’t have used in the summer. The lack of tracks in the river reveal just how undisturbed the fish are. But there’s more going on than that. Fish are spawning, and the rest of the fish that aren’t spawning have moved in for the feast. Starting in September, the brook and brown trout turn on the feed bag trying to bulk up for their fall spawn and for winter. Both are dressed in their finest- bright yellows and oranges, vivid spots and black stripes, white rimmed orange fins. They only reflect their surroundings, as the riparian trees erupt in flaming color, a forest fire that will last for weeks, and then leave the trees just as bare as any fire would. The bank side plants and flowers are vivid up until the moment the frost kills them. There’s a lot of reasons not to fish the cold season, which I’ll define as September through April. There’s a lot of reasons that anglers quit. Vacation season is over, so a lot of anglers have gone home. Many anglers are also hunters, and the hunting seasons kick off here in September, dividing the time of Michigan outdoors people. By the time November comes around, the deer season has everyone so distracted, no one is thinking about fishing. Then there are the shorter days. Even if you did want to come north fishing, would it be worth it when the days are only 8 hours long, and the first and last two hours of the day are intolerably cold? Age and ability can play a factor- rivers can be tough enough to negotiate without having to deal with ice and snow. 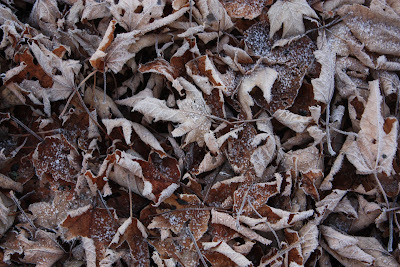 Then there’s the cold that seems to seep deeper and deeper with each passing year. Never mind the thermal reality, does anyone need that kind of reminder? No, you’re better off staying home tying flies and catching up on your reading, or traveling to Florida. This leaves the rivers wide open for the few willing to give up some hunting and brave the cold waters. What we know is that September through December are some of the best fishing of the year. In September the salmon start their annual migration, and the brook and brown trout go on the feed. When October rolls around, the streamer bite for browns heats up- it’s one of the greatest opportunities of the year to catch a two foot long brown during the day. This lasts well into November, when the trickle of steelhead in the streams becomes a flood. These silver freight trains are fresh from the lake, feeding like crazy, and attack streamers like lightning. The coho salmon continue to run, and post-spawn brown and brook trout line up to continue that feast. As December rolls around and water temps cool the steelhead continue to entertain, but the fishing can be more hit or miss. By the time you’ve hit January and February, why stop there? Sure the weather will absolutely shut you down some days, but if you watch the forecast you can pick a mild afternoon and score. What could possibly cheer your winter weary heart more than a chrome steelhead in January? It’s not just that cold season fishing, especially the fall, is some of the best of the year, the fish the largest and most aggressive. Fall is the magnificent season, colorful and dramatic. Everything has an urgency to it- the spawning of the salmon, the changing colors of the forest, the violent strikes of steelhead, the rutting deer and bugling elk. The shortened days add to this feeling- you really don’t have all day. You need to get in, fish your spots, and get out before the cold and darkness get you. Sudden snow storms in December can leave you stranded in swirling water and white. The chill in the air that rouges your cheeks, nips your nose and stiffens your fingers calls for special clothing and a thermos of something hot to drink. I think it’s this combination of challenges- cold weather, short days, solitude and big fish, that draws me to fishing those cold months. I’m not saying that the fishing will always be fantastic. You’ll have those days, those long cold windy fishless days, days when the river and sky seem to flow in gray monotone, days you wish you had stayed home and watched college football and tied flies. 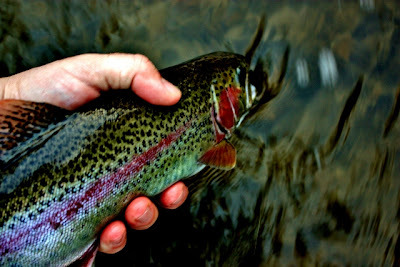 But if you do it, if you put up with the cold and ice and dry spells, you’ll also have sublime days, when the trout or steelhead are biting, when you can’t seem to do anything wrong. You’ll experience the sublime feeling of cradling a big fish at a time no one else even wants to be out there, you’ll experience a feeling of solitude and fortitude hard to find in todays world. So here’s my suggestion to you- go fish a couple of days each month this cold season. Buy some wool poly long underwear and fleece, get some of those wool fingerless gloves, and get out there. The deer season here lasts three months, surely you can squeeze a day in here or there. If you’re coming North for deer season, you’ll also be in Trout Country- shoot your deer, hang it up, then go hit a steelhead river for half a day. Sure the general trout season is over, but dozens of rivers, literally hundreds of miles of stream, are open year-round. Check the regulations, there’s bound to be some open water near you. If you’re not into big game, nymphing the fly water on streams like the Au Sable and Manistee can be productive. You’ll find that time on the water makes the winter go faster, more bearable, heck, maybe even enjoyable. I would like a good storm. Not the namby-pamby, do-nothing, snow-piffle we've been getting. I want a real storm, with whiteouts, feet of snow, howling wind, and bitter cold- something that makes you feel like you're surviving. This year, winter has been strangely absent, and until today, what snow we had has nearly melted off. Yesterday it was fifty degrees. I've lived through Januarys when the temperature never got above 10 degrees, with regular lows of -20 to -30 F. Months like that can drag long and arduous, but I never got tired of a good winter storm. I have not witnessed a true blizzard here in Northern Michigan since moving back here in 2000, and I feel much the poorer for it. Everyone remembers the blizzard of '78. I was a kid then, and despite how much more rudimentary forecasting was back then we still got some advance notice. We stacked the firewood high on the deck and in the house. Our wood stove worked better than our neighbors, and so we invited them to stay with us. This was fine with me, as their daughter Allison was my first girlfriend, a childhood sweetheart of the innocent type with whom you hold hands and know that you will marry her. I didn't. I still wonder. The storm started as promised, and I'll never forget the howl of the wind, and of the long periods of time in which it was impossible to see more than a foot or two out of the windows. It howled and pounded down for three days. We played cards and board games, and ate bean soup, in an almost carnival atmosphere, a tension in the air as the lights flickered and the jet engine roar of the wind permeated everything. It was fun at first, perhaps similar to the hurricane parties my Florida friends have told me about- they buy supplies, food and water, board up their windows and doors, and then make a party out of it. Board games, cards, cocktails. When the lights flicker out they light the storm lamps and candles. When the roof falls in they take it seriously. Our roof didn't fall collapse in '78. We got up on the second day of the storm and the snow was level with the bottom of our windows. That day, as we ate our Cheerios and bacon and eggs, played cards, then Scrabble, then god knows what, we watched the snow climb ever higher until the daylight coming in over the snow was a mere slit. That was a great storm. Somewhere out there are pictures of my brother and I sitting on the roof of our house, having walked up the drift to the roof. When it was over, and we opened our front door there were only two inches of daylight. That was one of the more memorable storms, and yet we used to get blizzards here every winter. Not mere winter storms, but howling, multi-day storms, in which we had real whiteouts. Let me explain whiteouts. That footage of heavy snow you see on the Weather Channel or CNN are not whiteouts. They don't show whiteouts, because in a real whiteout, there's nothing to show. I've been in whiteouts while both walking and driving. In a real whiteout you see nothing except blinding, driving whiteness. They are terrifying. The footage you see on TV of admittedly heavy snow, in which you can see street lights, buildings, and lamp posts are not whiteouts. A whiteout is when you only see white, when you can only make out a vague outline of yourself, when it is literally possible to walk into a tree or other object because the only thing you can see is your own chest- yes you're looking down, you don't dare look up into that howling blaze of stinging snow. I have been tied to a rope as a child, to fetch wood in a whiteout. I was thankful for the rope. Circa 1980 we got so many blizzards that Michigan had to change its laws. We had missed so many weeks of school to blizzards- both the storms themselves and their aftermath of digging out- that a limit was established to the number of snow days that could be taken before they had to be made up. As I recall, we spent at least an extra week in school in our precious summer, which we greatly resented. Our neighbors had a very big hill that they would let us sled down. That year the gully down the center of it rounded over with snow, which the wind burnished into a hard icy surface. The speed was exhilarating, and for the first time ever we had to bail from our sleds before we hit the fence. It was a point of honor as to who could wipe out in the greatest style, the greatest burst of flying snow and tumbling sled. We would wipe out, and then lay in the snow, tasting it on our lips, pretending to lay dead. Only the sound of the next sled coming down would get us up, afraid of being hit. After all the crazy things we did as kids on sleds, I can't believe that we had all of our teeth and intact spinal columns. We used to intentionally do these hay-maker tackles mid-slope, and I remember our sisters going home crying on several occasions. My brother and I could be pretty rough. To be fair, we sent each other home crying several times. Our parents finally put a firm ban on these types of tackles- someone was going to get hurt. At one point this winter it was ten days before we were plowed out by the County Road Commission. You'd think that the National Guard would be sent in to provide relief supplies, and yet this kind of winter was considered so routine that everyone was prepared. We all had our wood supply laid in well before the snow came, most families had freezers which they kept stocked with venison, and often with poached elk, and surviving the brutality was a point of pride, it was considered normal. In the mid 80's the winters gradually got easier. We got lots of snow, and regular blizzards, but not like the '74-'81 period. In '85-'86 we got record low amounts of snow and cold- in late February the ground was mostly bare. The following winters were weak, though I drove home 100 miles through a blizzard the winter of '90. I remember driving my friends truck home after a day of skiing, trying to keep enough forward momentum to burst through the hood-high drifts, spinning crazily sideways when the gusts of wind would strike us on the icy road. That spring I moved to New York city. I experienced some great storms out East, at least one hurricane and several Nor'easters. They were some great storms, but not blizzards. In '93 we got two feet of snow, and then freezing rain, followed by frigid temps. If you've never been, New York has a parking system which alternates sides of the street you can park on on different days to facilitate street cleaning- Alternate Side Parking. Our cars got plowed in by the garbage trucks (yes, they use garbage trucks to plow), then they were cemented in place by the rain. The traffic cops ticketed everyone. We went to court to protest, and the incredulous judges dismissed all of the tickets. There was no place to move your car to- the other side of the street was a six foot deep pile of snow and ice, and our cars were locked in, as if in concrete. I don't think I moved my car for six weeks. My ex and I broke up in '98, and when my legal shenanigans were wrapped up in 2000 I moved back north. I will never forget the moment, standing on a bridge, once again in Trout Country, breathing in that scent found only on a free-stone trout stream. I was home. And yet since then, the winters have been curiously tame. Sure, we've gotten some snow. Circa '02-03 I went to bed with flurries in the forecast. In the morning I got up to find 34 inches of new snow. And it didn't stop there, we got seven feet of snow that week. That was an epic winter, but we still didn't get any blizzards. 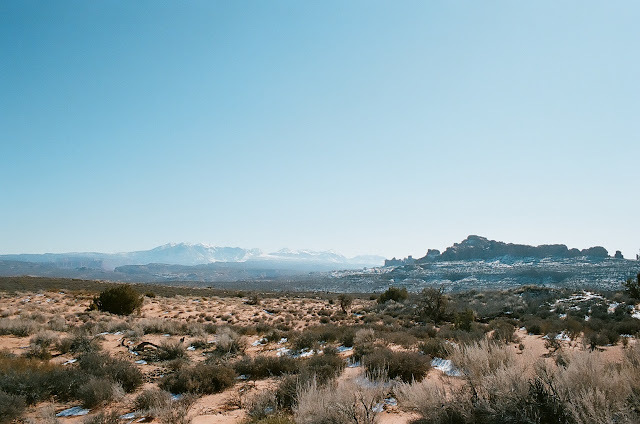 I've been told that the '08-09 winter was bad, but my father had died tragically that fall, I was out of work, and some friends gave me a job in remote southwest Colorado, and so I missed the whole thing. Of course, while I was gone my artesian well had to clog, flood my driveway and alarm my neighbors. I've been told that the snow was measured in feet, but it also melted off at least twice before spring. When I got back it was over. This winter will go down as one of the mildest on record. We had a winter storm warning ten days ago, but it was so lame as to be sad. This week was warm, with several days above freezing, even at night. Now we're under another storm warning, and yet the snow falls, big as cats, a sign that it is still too warm. Western perceptions are that all eastern snow is wet snow, and yet here where I live, historically, our snow was always light, dry and fluffy- powder if you will. Not anymore. Most of what you will ski on here will be made by machine. I don't know about global warming, I only know this- that our winters are much milder than before, and that it adversely affects our trout streams. We need heavy snow pack and a late spring to ensure enough cold water that can sustain trout all year. Heavy snows are what charge the moraine aquifers we have here for the year. When winters such as we're having occur, rivers drop low and super clear, and the steelhead keep their distance. It's a shame- the smelt have come back, and the salmon and steelhead in Lake Michigan are bigger than ever, but the stream flows are so low that a lot of fish are staying in the lake. We could use a good storm. We could use some cold weather, whiteout conditions, howling wind, blinding, driving snow, drifts that you can't see over, week after hard winter week. It would make us better people. It makes for better fish. It makes for better fishing. We could use a good storm. Boyne- it may not be white-out, but close enough. Aaaaachchhhhhhhh. That's the kind of sound you make on a Tuesday. Yawn, streeeetch, scraaa- wait a minute- it's Tuesday. What happened? I somehow managed to skip Coffee yesterday. I can't imagine all the bleary eyes out there. The shock, horror, utter disbelief at having to start the week without your Monday Morning Coffee. Now it's Tuesday, the worst day of the week, you haven't had your coffee, and you're angry as hell. Please accept my apologies. Ok, so I see your bloodshot eyes, smell the foul stench of your.... ok, that's going too far. By the way, I've hired Fred Willard as a consultant for this blog and he offers some excellent blogging advice in the video. Speaking of blogging advice, I posted a survey asking my readers what they would like to see here at Fontinalis Rising. I'm not proposing any full-scale changes here, and this is just a personal blog, but I would like to perhaps come up with a format and schedule so you know what to expect, and while I'll always write about what interests me, it's good to hear from readers what they like and dislike. The results came back as follows. 38% of you would just rather go read Troutrageous!. This is fine- I'd rather do that too. I see this as a self-solving problem, but if you like I can post a permanent link in case you find yourself lost again. 34% said "better photography. Let me refer you to Russ Schnitzer's blog. All kidding aside, I have been underwhelmed by the photo's I've been posting lately. I'm finding that you can either fish or shoot pictures, but it's very difficult to do both. I'm getting tired of the "blogger" shot- you know the one, fish in hand. I'll definitely try to pick it up a little. 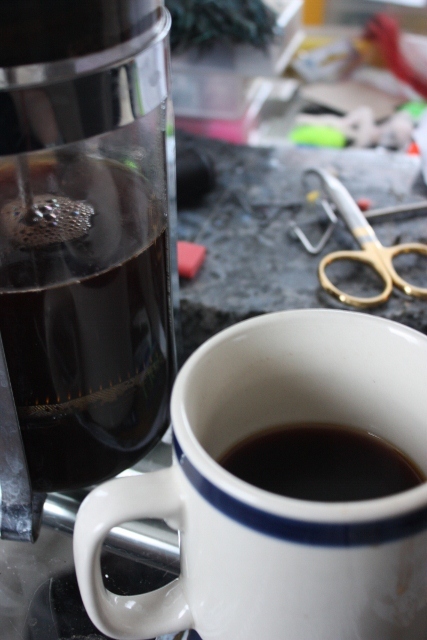 36% of you specifically mentioned that you want me to keep doing my Monday Morning Coffee feature. I promise that MMC will always be a regular feature of this blog.... um, starting next week. 24% said they want me to focus on the creative writing. I'll do my best. Unfortunately for this blog at the moment, all of my brainpower has gone into articles for other publications. Once those issues are no longer current I'll post those articles here if they're relevant. Look for a piece on winter fishing this week. 42% of you said don't change a thing. Thank you. Thank you very much. I'm looking to streamline and weed out some chaff here, not reinvent the wheel. 3% of you said you'd like to see adult content- something about naked women fishing. Maybe that would improve my photography. There's also a good chance all the pictures would be out of focus and askew. I'll be taking applications for models. 10% want to see some fly fishing news. I intend to start a weekly news post, just because I want to. Anything I come across in the world of fly fishing I think is relevant or interesting- a good blog post, news items, video etc. I'm thinking this will be a Thursday/Friday thing. all percentages (187%) were completely made up, as I didn't feel like actually figuring them out. I'm a writer, not a math whiz. To the person who wrote that they want me to post on Upper Peninsula fishing, especially the Fox River near Seney Wildlife refuge- let me explain something. If you've read my blog for any length of time, you may notice that I rarely mention a stream name. I catch plenty of flack from friends and locals if I post here or in social media on specific streams, runs, hatches and locations. There's a good reason for this. Unlike our more famous rivers such as the Au Sable and Pere Marquette, the streams where I live in the tip of the Lower Peninsula are tiny and can't handle the same kind of pressure that those bigger streams can. Yoopers (as UP locals are called) are even more militant. If I started posting about UP streams, provided they would even let me cross the Mackinaw Bridge, I'm sure I could expect to find my truck vandalized and tires slashed. I'll tell you that in general, the Fox is a fine and even famous brook trout stream, which I haven't fished in several years. There's miles of it to explore, and I'm sure if you go in June you'll catch some trout. If you contact me privately I may be able to share some info. Winter is still a no-show here, which has made for some pleasant fishing. I've gotten out twice so far. Friday I was actually too warm in my fleece and ball cap and didn't need gloves. I caught several small fish and was pretty disappointed in the day, but at the last minute came up with three nice fish in four casts- a 17 " rainbow, a 22" steelhead, and 13" brown. Talk about turning a day around. I haven't been tying much yet, but the local TU chapter is tying tonight at City Park Grill, so if you're in the area, stop in, have an appetizer and a beverage and hang out. I see that a few guys have been out ice fishing. Not me. We've had hardly any weather cold enough to make ice. As of today it hasn't gotten below freezing in 48 hours, and it rained a good portion of yesterday. They say it's going to get cold this weekend, but if you're coming up to visit and want to hit a lake use extreme caution! Definitely do not go out without consulting the locals. There's still not enough snow for snowmobiling, and don't think that because the lakes are ice covered that you can take your machine on them. People die up here every year under normal condition, and this year is not normal. At least my heat bill should be reasonable. By the way, the ski resorts are open. Well, this is getting long and it's time to get some things done. I'll leave you with a fish pic, you know, like the ones I said I'd try to get away from. Like so many, this blog is going through its changes and soul-searching. I've been at this for nearly a year now, I'd say a very successful year. Yet, I want to make this site better, better for you. I've written some good stuff, and made some woeful mistakes. In the end, what I want this site to be about is the soulful side of fly fishing- why we're out there, what motivates and obsesses us, what makes us keep going out there, rod in hand, in all weather after fish. Please, if you will, fill out the form below and let me know what you want. Feel free to rant in the comments below about how I'm the lost son of an ill-bred mother if you like. Just give me some insight into what makes you tick as a fly angler and blog reader. I've been sitting here in my tree for two hours now, my frustration increasing by the moment. I've had no time to hunt this year, little time to practice my archery, and I've hurriedly thrown my gear together this morning, then spent two hours driving around trying to find the broadheads I like. I must have misplaced mine when I moved last month. At nearly $50 for three of them, plus about $13 per arrow, that means I'm flipping over $28 into the woods every time I squeeze the trigger, and no, it's not always re-usable. I went to one of my better spots only to find someone parked there (I know who you are- see if I ever ask you to help me drag a big buck out again. ), then went to another spot on state land I know of where a dozen trails converge. I got all the way up my tree, only to realize that the wind is roaring, and shaking my tree hard enough to make me doubt I can stand, much less shoot. Add to that the fact that I've chosen to climb an ash tree in a forest ravaged by emerald ash borers. There's downed trees everywhere, and the broken top of my tree lodged at eye level in the tree next to me is not reassuring. For the next two hours I watch the empty woods, save for a lone fox squirrel foraging beech nuts. I'm relatively warm and comfortable in my climbing tree stand, but the howling wind makes it impossible to hear anything else, and the blowing leaves and limbs makes it almost impossible to spot anything if a deer does decide to come through. Now the failing light has turned everything that dull November monochrome, the wind is still blowing, I have a total of three arrows, and doubt I'd be able to see anything in the growing gloom anyhow. I've forgotten my GPS today, and I'm hunting in a stretch of woods I've gotten lost in with GPS, so I'm starting to formulate an exit strategy. That's when I look to my right and see her- a decent sized doe, 80 yards out and coming my way. Why can I see her so clearly? A second doe trails her. When I'm sure they're not looking, I stand and attach my release to the string. I ranged several trees in all directions from my position when I first got settled, and I start picking shooting lanes, trying to decide which to use, at which point to shoot, decide what my options are. I haven't practiced nearly enough- I try to shoot at least 30 minutes a day in the months leading up to the season, but haven't nearly shot that much this year, and I feel a little rusty. I mentally run through my shot, from stance to release to follow-through. I've decided to not take the shot directly in front of me as the doe will be slightly angled toward me. If I wait until she reaches the logging road to my left I'll have a clean broadside shot. Being left-handed, this will require me to turn my whole body. The deer are directly ahead of me now, but the wind is covering any sound, and when they are both looking away, I turn left, then make sure my left leg is against my seat to ward off vertigo while I'm aiming. I seem to get vertigo in this gray light and wind if I'm not touching something- not a good thing when you're 30 feet up a tree. These deer are relaxed and unhurried, ideal for taking a shot, but it still makes me impatient. The moment finally comes. She has reached the edge of the logging road and stops. I come to full draw. The doe is at 25 yards out and broadside, which is third pin. I try to clear my mind and release, but instead of releasing, I push my hand forward, essentially letting off. Nuts. I've fought target panic for years, quite successfully, so to have this vestige of it return now is frustrating. It's a sign of my lack of practice. The doe has neither seen nor heard a thing and still stands there, so I draw again. This time I settle my pin, hold for a moment and release. There's a satisfying whack and the doe leaps in the air, runs 15 yards then stops, looking behind her. How did I miss such a chip shot? At first I still think I got her and expect her to fall over right then and there, but she stands, looking back to where my arrow impacted into the ground. She has no idea what happened. I remove another arrow from my quiver and draw again. She ran at an angle and now stands five yards behind a large beech tree I ranged at 27 yards. This may seem to be an awkward distance to shoot when I've already missed at 25 yards, but what I know is that I never fully dialed in my bottom pin, and it's dead on at 32 yards. I settle the pin tight to her shoulder and focus on a smoother release. As it flies I get the mental image of an arrow in clean flight. In archery, there's shots you wonder about and there's shots you're certain of. This time the solid whack of the arrow hitting its target is clear, but the doe's reaction is even clearer- she ducks her head, tail clamped tight and lights out on a death run. Both deer run to the next ravine, only one runs out. I know I've got her. Because of the failing light and my lack of GPS I make the decision to climb down immediately. I go and examine the area the doe was standing when I shot her, but can't find anything, and so I gather my gear, load up and walk out. I actually make it back to my truck without turning on my headlamp. Now I have another decision to make- do I make the 30 minute drive home, get my GPS and buy some propane for my lantern (another oversight) and head back to find her, or do I leave her lay overnight? The area is infested with coyotes, so I'm taking a considerable risk. I decide to take the chance and leave her. I don't have anyone to call for help tonight, this area is very confusing at night even with GPS (the trees tend to block a clear signal), and despite the doe's body language when hit, I want to be sure she's dead. Saturday morning I wake up bright and early, eat a good breakfast, load what I'll need for the retrieval and head back. I spook five deer in the vicinity of my tree. It takes a matter of minutes to find the first arrow- it's clean, a complete miss. Whatever. I then walk to where she was standing for the second shot. I can clearly see where the two deer ran, but don't find any blood or hair. I actually spent a couple of minutes looking for the second arrow in the ground. Did I miss? I replay the scene in my mind- no I got her. I head toward the ravine in the general direction the deer have gone, circling for a blood trail. No sooner do I reach the edge of the ravine I spot white and brown hair, 15 yards away. She never made it to the ravine. As a matter of fact, she only made it about 60 yards. I'll bet she died in less than 10 seconds. My coyote fears prove well-founded. They've torn a dinner plate patch of hair off of her belly, but for some reason that's as far as they got. It makes me wonder- did they get run off by another deer, a buck perhaps, or had they just found her right before I did and ran off at my approach? Hard to say. The presence of ravens in the area tells me it was probably the latter. It takes me less than thirty minutes to field dress her, maybe another 30 to drag her out and load her. I'm home before noon. I've hunted a total of two and a half hours this year, and have enough venison to get me by. I'm happy with that. Auuuughhhppphhuuaahhgghhgghh. Guten tag every body. I'm channeling Dr. Nick here. Yawn. Yawn again. Streeeeeeetttttcccchhhh. Scratch, scratch. Aaaaaannndddd repeat. Man I need some coffee, and so do you. Well, it's official- it is now 2012, and thus the world will end on December 21. This puts a lot of pressure on us fly anglers- there's still a lot of water, several species, and a couple of techniques to try out before the Big Nothingness. Get crackin'. Personally, I don't buy this whole 2012 business- you won't see me running naked and screaming through the streets December 20th. I'll do that on the 19th. Chances are I'll be on one of the local rivers dunking egg patterns and lamenting the passing of summer, not the end of the world. Either way, let's not go to that dark place. Right now 2012 lays spread before us, a veritable feast of fishing to come. It's time for us to start plotting (as if we haven't started already) our fishy plans for the year. 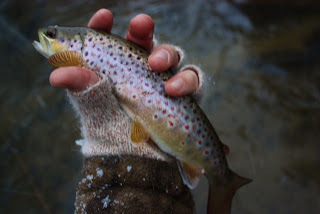 I kicked 2012 off right, by fishing in the midst of a snow storm. I landed one small brown when I got there, and one more right before leaving. The rainbows were mysteriously silent, the steelhead non-existent. If you check the Jealousy Counter in the right-hand side-bar you will see that it has been reset, and registers one trip. A fresh start. I was a blogging maniac last week, posting 6 posts in five days, which is a lot for this site. If you haven't been here in a week or more, make sure you scroll back through and see what the action was. The end of the year spurs a lot of introspection, and I had several things to get out and done. Don't miss my interview with artist Becca Schlaff, or my shout-out to my favorite blog posts by my favorite bloggers of the year. Most of my writing lately has gone to other outlets, and I have several pieces in the works I'm pretty excited about. I'll try to get some writing done for this blog soon. I need to get some fly tying done, it's time to learn some new patterns, maybe get into tying some dries. Well, it's time to get to work- have a great week. We're getting our first storm of sorts today so I'll leave you with a winter scene.